An e-mail from my niece, who sings in the choir of Saint Luke’s Cathedral in Orlando, tells me that they’ll be performing Théodore Dubois‘s Seven Last Words on March 9. This reminds me that, with Lent beginning tomorrow, whole swaths of the repertory that play little part in concert-hall life will received hundreds of performances around the globe. Dubois, who was organist of the Madeleine in Paris and director of the Paris Conservatory (not to mention being godfather of Nadia Boulanger) was once a considerable musical influence, now not much thought of. However, he has been widely performed through that one highly dramatic work, composed in French for the pious meditation of fashionable Parisians. This got me to thinking of another work that occasionally appears in concert halls but is drastically present in churches between now and Easter, the Stabat Mater of Pergolesi. What is its origin? What else is it related to? Giovanni Battista Pergolesi (1710–1736) brings something new to history: he was the first composer to enjoy posthumous fame after an obscure career and a pauper’s burial. 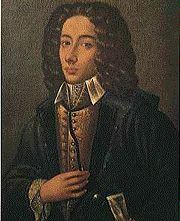 Pergolesi’s last two works were settings of expressive Marian texts, Stabat Mater and Salve Regina. While the Stabat Mater was to become his best-known work (eclipsing the Scarlatti setting that it had been modeled on), much of Pergolesi’s fame came from his comic opera La serva padrona. That genial comedy’s celebrity is understandable, since it epitomizes the progressive opera buffa that Rousseau and his allies tirelessly propagandized. More crucially, the style of La serva padrona was indispensable to the Mozartian operatic synthesis. The stylistic distance between opera and liturgical music was not vast in the eighteenth century. A successful composer of the time set out to use his best expressive arsenal in the service of the text at hand — preferably poetry susceptible to dramatic treatment. The Stabat Mater text (which dates from the thirteenth century but was only added to the official Roman Rite in 1727) is opera-like not only in its emotional situation and vivid imagery, but in its form as well. Such Latin poetry of the late Middle Ages has little in common with ancient Roman verse; its regularly accented rhythm and rhyme are much more akin to those of eighteenth-century opera librettos. To Pergolesi — or to Bach or Mozart — musical style was divided not into sacred and secular but into antico and nuovo. Composers knew perfectly well, and often demonstrated, how to compose in the old style (derived from the sixteenth-century polyphonists); but, no matter how well acquainted they might be with the style of Palestrina, an up-to-date expressive style was their first language. The latest manner was, not incidentally, more acceptable to patrons and the public, who demanded the fresh, the current. Compositions like Pergolesi’s Stabat Mater and Salve Regina of 1735 are also indebted to the vogue for private enjoyment of multi-movement solo or duet cantatas with strings and keyboard (and the 1727 publication of his cantatas in Naples was in fact the first sign of a Pergolesi revival). Even as opera continued to spread its wings and gather a greater public, the cantata remained the most refined vocal-instrumental music of the aristocratic chamber. While extroverted church music had become very common indeed in Italy, many noble lay fraternities continued to cultivate a more reserved, less public music. It was for one of these associations, based at the Neapolitan church named for the Seven Sorrows of Mary, that the Stabat Mater was commissioned. (Since the text belongs to the feast of the Seven Sorrows, it was no doubt a sort of theme-song for the brethren.) The scoring, vocal devices, and scale of the musical architecture are all consistent with those of the grander chamber cantatas. Monteverdi’s Venetian Vespers had long since set a distinguished precedent for bringing the more exalted chamber procedures into the chapel. Pergolesi’s Salve Regina, with its stately eleventh-century prose cadences combined with emotive metaphor, is a particularly worthy inheritor of the tradition. It did not take long for the Pergolesi Stabat Mater to attain international currency. (The Neapolitan embassy chapels scattered around Europe may well have been a means of this.) By 1745 John Walsh, Handel’s publisher, had put out a derivative of it called “The Dying Christian to His Soul,” with tactfully Protestantized verses confected by a Catholic, Alexander Pope. Nothing, of course, testifies more surely to a work’s popularity than its ability to inspire questionable commercial ventures. Other publications of “principal airs of the hymn Stabat Mater by Signor Pergolesi” further attested its British sales-worthiness; a Leipzig arrangement of the music as Lutheran “meditations on the Passion” survives; and J.S. Bach himself adapted the music to the penitential Psalm 51. Pergolesi’s unmarked grave outside the church walls was soon supplemented with a memorial tablet inside, and a cathedral chapel was eventually dedicated to the memory of the erstwhile pauper. But his best monument is being perpetually erected by generations of enthusiastic interpreters of his careful, intense and personal style.